Does Peanut Butter Cause Diarrhea? Peanut butter should not cause diarrhea. In fact, the Cleveland Clinic recommends adding peanut butter to your diet if you develop diarrhea. If you are allergic to peanuts, however, diarrhea may occur after you eat peanut butter. Consult your doctor if you experience diarrhea or other adverse reactions after eating peanut butter. Your doctor may recommend that you see an allergist for proper testing to confirm or rule out an allergy to peanuts. A peanut allergy is one of the most common food allergies, according to the Food Allergy Research and Education website. Your immune system doesn't recognize that the proteins in peanuts are safe and harmless. Instead, the immune system overreacts to the proteins as if they were a virus or bacteria. The body produces certain antibodies that begin fighting off the peanut proteins. During this process, mast cells located throughout the body begin releasing higher levels of histamine. Histamine helps to defend and protect the body, but can cause inflammation in soft tissue. A peanut allergy can occur out of nowhere, but another possibility is salmonella. There have been isolated cases of salmonella in peanut butter. If you have diarrhea but do not suspect allergy, or if everyone in your household that ate some is having the same symptoms, seek medical attention as soon as possible. 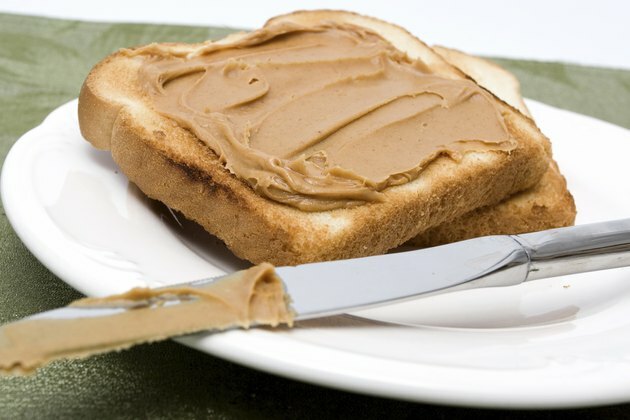 A common symptom of a peanut butter allergy is diarrhea, according to KidsHealth. During the allergic reaction, the lining in the small intestine can become inflamed and swollen due to increased levels of histamine. The result is stomach pain, bloating, gas, vomiting, nausea and diarrhea. The diarrhea should continue for a few hours and subside once the peanut butter is removed from the system. If the diarrhea continues, or is accompanied by a fever, it may be a sign of a more serious condition such as salmonellosis. Common symptoms of diarrhea from a peanut butter allergy are thin or loose stools, watery stools, abdominal cramping and a sense of urgency to use the bathroom. More serious forms of diarrhea can cause fever, weight loss, and blood, undigested food or mucus in the stool, according to the Cleveland Clinic. Dehydration is a common concern when you suffer from diarrhea. Treating diarrhea from an allergic reaction to peanut butter is a process of patience. Common medications used for diarrhea will not be useful or beneficial, because your body needs to rid itself of the peanut proteins. The Cleveland Clinic recommends that you should drink two to three liters of water on a daily basis to help cleanse your system. Avoid eating solid foods while the diarrhea persists. Once the diarrhea stops, you should begin eating small, basic foods, such as rice, white bread and applesauce. Avoid greasy or highly processed foods. If you've been diagnosed with a peanut allergy, avoid eating peanuts in any form. Read the product labels for what you're eating before you eat it. Do not consume peanut butter if you're allergic to peanuts or tree nuts. Can a Peanut Allergy Cause a Chronic Cough? Can My Son Have Peanut Butter If He Has Diarrhea?